SalesRipe is a cloud-based solution for identifying sales leads and prospects from a database containing more than 20 million business and 200 million consumer sales leads. Users can create targeted prospect lists, manage leads, track outreach and follow-ups, create and schedule tasks, and more. 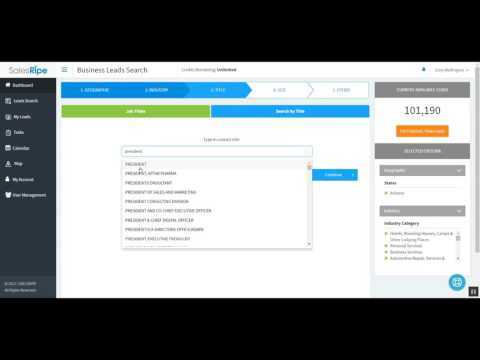 SalesRipe allows users to search for leads using multiple search parameters including industry, location, company size, annual revenues, age, and more. Searches can be refined by contact title, contact methods, and technologies used, enabling users to tailor sales pitches based on the CRM, marketing, or analytics tools currently used by the company. Full prospect contact information including company name, full name, address, email address, and phone numbers can be accessed through the SalesRipe database. With SalesRipe’s built-in customer relationship management (CRM) system, users can filter and prioritize leads by a range of elements such as ‘status’ or ‘date updated’. Tasks can be created, added to lists, and tracked, and users can manage all all leads, searches, and calendars from a single dashboard. Lead lists can also be downloaded for use in other CRM systems. Awesome Service, especially their customer services! A lot of Back-up data for our marketing campaigns.We've been using salesripe for about a year and we've been getting 80-90% accuracy of data. They also have the best customer service compare to other lead sources. The email support best customer rep leaders I've encountered ever. I hope they will continue their awesome service for more years. I commend these people and will recommend their system for data (Contacts) Lead source for your telemarketing company. We've been using salesripe for about a year and we've been getting 80-90% accuracy of data. They also have the best customer service compare to other lead sources. The email support best customer rep leaders I've encountered ever. I hope they will continue their awesome service for more years. I commend these people and will recommend their system for data (Contacts) Lead source for your telemarketing company. We've been using salesripe for about a year. Honestly, it sometimes gives you website bugs and system error but they will fixed it immediately. Great benefits, great leads and accessible information.I like the fact that I got alot of leads way more than I had expected. What did was put the name, company or email address for candidate and i'm provided with a wide selection. I like the fact that I got alot of leads way more than I had expected. What did was put the name, company or email address for candidate and i'm provided with a wide selection. It would have been great if I could narrow down my search with come detail information. lets see like a name and location and got the specific or a short list , but i guess there will be trial and errors in everything. High-quality lists of potential M&A targets and acquirersThe sheer volume of information on U.S.-based companies is staggering. Additionally, the interface is user-friendly and intuitive. The sheer volume of information on U.S.-based companies is staggering. Additionally, the interface is user-friendly and intuitive. The lack of information on international companies requires me to look elsewhere to complete lists and data sets. Scaled lead generation and grew my business due to the sales I've made from those leads. I loved how easy it was to use - incredibly simple and powerful. I love the ability to export to different formats + most importantly being able to choose what values you'd like to export. Allowed me to run marketing for my business more efficiently as I no longer had to waste my time w/ scraping potential leads and manual work. I loved how easy it was to use - incredibly simple and powerful. I love the ability to export to different formats + most importantly being able to choose what values you'd like to export. Allowed me to run marketing for my business more efficiently as I no longer had to waste my time w/ scraping potential leads and manual work. I was not able to find any drawbacks while using Salesripe. It met and exceeded all my expectations. I can't believe you can't sort the results alphabetically before you export them into "my contacts." For example, if i look up "Jim Huntington" there might be 200 of them. I have to scroll through page after page looking for the company name or state of the Jim Huntington I want. If i want to sort them alphabetically, i have to export all 200 to "my contacts" and sort them then. That's insane. Basic: $49/month - 200 credits/month. Plus: $79/month - 1000 credits/month. Ultimate: $129/month - 2500 credits/month. Enterprise plans are available on request. SalesRipe’s database contains more than 20 million business and 200 million consumer sales leads, which users can search for prospects based on industry, location, company size, title, income, age, and more. Users can access prospect contact information including company name, full name, address, email address, and phone number in the SalesRipe database. Prospects can be identified based on which CRM, marketing, or analytics tools they use, enabling users to tailor their sales pitches based on each lead’s potential needs. Through the lead manager, users can track all lead and customer information, initial outreach efforts, follow-up tasks, and more. The built-in customer relationship management (CRM) system allows users to save searches, create and schedule tasks, and manage leads within a single dashboard. Below are some frequently asked questions for SalesRipe. Q. What type of pricing plans does SalesRipe offer? Q. Who are the typical users of SalesRipe? Q. What languages does SalesRipe support? Q. Does SalesRipe support mobile devices? Q. Does SalesRipe offer an API? No, SalesRipe does not have an API available. Q. What other apps does SalesRipe integrate with? Q. What level of support does SalesRipe offer?